We believe in canine hygiene. We prefer dogs that don’t smell like dogs. We believe in baths and regular bathing. We were this way with OD, too, when she arrived. That discipline’s worked out pretty well so far. Our Great Dane puppy Luna arrived home smelling like her siblings so MW decided to drop her into fives inches of bathtub water and introduce her to soap. An “all-natural botanical blend for a gentle, tear-free bath” product she bought from Petco, I think. Three baths later and our dog has become surprisingly comfortable getting soapy and very damp. When she isn’t smelling of whatever scent the botanical product maker sourced from China Pharma of Shenzhen, she smells of our herb garden. Our rosemary shrub is close to the back wall of the house. For some reason, she’s taken to burrowing through it. As she pushes through a space a cat might squeeze through with difficulty, the rosemary oil transfers to her coat. MW remarked yesterday that Luna smells more and more like a roasting chicken. I’d offer that she’s more like a plate of rosemary potatoes. Luna’s effectively turned into the “Dog Your Dog Could Smell Like”. 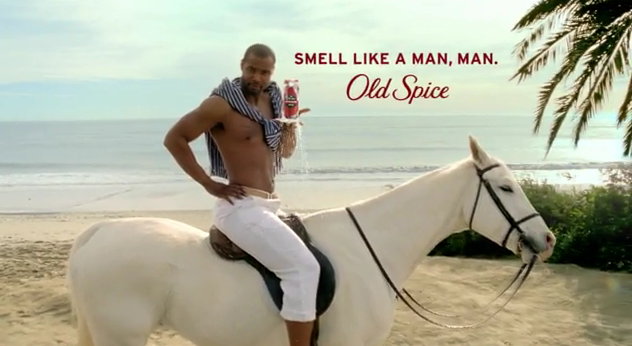 “The Old Spice Man” might agree. Hello people, look at your dog, now back to me, now back at your dog, now back to me. Sadly, he isn’t me, but if he stopped sniffing poop from other dogs and switched to rosemary bushes, he could smell like he’s me. Look down, back up, where are you? You’re at an off-leash park with the dog your dog could smell like. What’s in your hand, back at me. I have it, it’s a new bone, Air Bud Blu-Ray disc and Petco gift card for that thing you love. Look again, the gift card is a subscription for a pre-paid year of poop cleaning.